Transformers is a toy line that's consistently on the bestseller list for kids' toys. 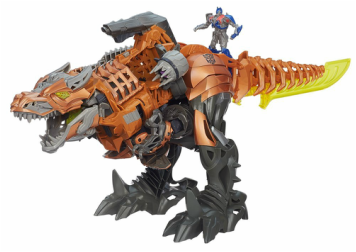 Every Christmas, there's generally one Transformer toy on the most wished for list - and this year it's the Stomp and Chomp Grimlock. This is a 20-inch robotic toy that transforms from a big robot into a dinosaur. Its purpose is to battle the evil Decepticons. As a dinosaur, it has eyes that light up and jaws that clamp down and chomp on whatever gets in its way. Of course, if there's a battle raging on, then the Stomp and Chomp can use any of the weaponry that pops out - or the sword that helps it win against anyone who comes up against it. If you want to, you can invest in some extra power battlers and One-Step changing figures. These are sold separately, but when you pair them with the Stomp and Chomp Grimlock, they activate a variety of sound effects, lighting options and weaponry. It comes with the two AAA batteries that you need, and then your child gets to decide if they want him in robotic mode or dinosaur mode. Both are fierce and can wage war on any enemy. This particular Transformers toy is one that all collectors will want to have. The toy comes with an Optimus Prime that rides the Grimlock character. Optimus Prime has eyes that light up. The 20-inch Grimlock transforms when your child pulls a lever and he becomes upright in a robotic stance. He's durable, too. Kids can play with him without worrying that he's going to fall apart in an instant. When you use the weapons that pop out, it makes sounds of a laser. Plus, in dinosaur stance, the Transformer growls at the enemy. It's great for smaller kids because it's a one step transformation, too - nothing too hard. Parents have an easy assembly job to do out of the box. It's not rigorous or too detailed. Demo batteries are already included, but you will need more. It also comes with an instruction booklet, but you can understand everything without it if you happen to lose it in all of the Christmas chaos that ensues under the tree on Christmas morning. Transformers are great for kids who love the movies and toys - or for adults who like to collect this particular line of toy. It's bound to be topping many Christmas wish lists this year, so it's a good idea to grab one before they sell out.